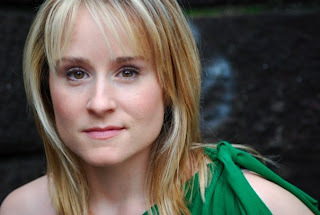 Check out this exclusive interview with Ms. Heather Spore, current ensemble member and understudy for Glinda at “Wicked” on Broadway. She’s been with the show for four years – over half of the show’s run on Broadway! Read the enlightening and entertaining interview below, courtesy of Ms. Spore. Thanks! I would consider my first professional gig in Ft. Worth, Texas. I was Corie in Barefoot in the Park. I was still Non-Equity at the time, but it was the first non-community theater job I had. Since Texas is a Right-to-work State, you don’t have to join the union to work at a Union theater. I didn’t join Equity until I moved to NYC. I auditioned for Wicked as a Glinda understudy, before the show was opened. Honestly, I did not understand what was happening in the scene for the audition (Cornfield/Fight Scene). After the show open ed, I went in several times for both Glinda and Nessarose. 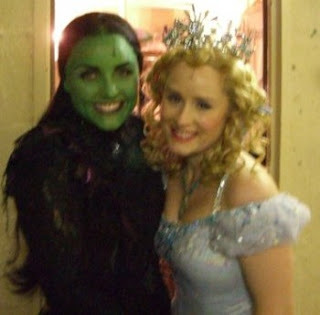 My voice is much more suited for Glinda, but I went in everytime they wanted to see me. If the casting director sees you as a part of the Wicked family, they will find a place that is right for you. In my case, they just kept auditioning me for different slots until they found the right fit. I must have sang 14 times and danced 3 different times. I had a bit of difficulty learning the dance combo, so it wasn’t until the third time that I nailed it! My final audition was for Stephen Oremus and Craig Burns of the casting office. I sang 16 bars with a high C. Got called back to dance, finally nailed it. Then got a call about an hour later that I would be joining the Broadway Company! My Wicked mantra is “Never give up”! The standard rehearsal process for a new replacement in our show is 2 weeks. Keep in mind I was not a Glinda understudy right away. We started with fittings for shoes and costumes. Then came vocal rehearsals, and watching the show every night. Then came dancing/blocking. It was just me and the dance captain, Kristin Gorski in the rehearsal room for the entire 2 weeks. I didn’t work with another actor, until the day before my put in. That was for 30 min to do lifts. I wasn’t sure it would all work out. I ate and slept Wicked. It haunted my dreams! The Thursday before I was to make my Broadway debut on Tues, was my put in. The put-in is when you get to do the whole show with the entire ensemble. Once. You are in costume, acting and singing full out, and everyone else is in street clothes. Not that you are thinking about anything but doing all your stuff right. In retrospect, it is a very funny event! What was your first show like? What emotions were running through you? My first show in Wicked was 4 years ago! It was a complete out of body experience. I could not tell you how I felt. I do remember backstage right before the ballroom crossover, Ben Vereen came up to me and introduced himself. I don’t remember anything else besides that! I was so busy thinking like a computer about what was next that I did not have time to take it all in. 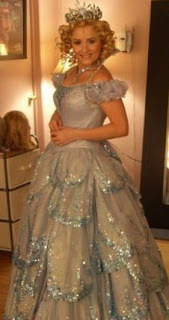 What is your favorite costume in the ensemble and as Glinda? My favorite costume in the ensemble is my One Short Day dress. I could do without my wobbly hat, though. I do believe that I got motion sickness from it once when I felt ill! The front flap just continually flaps in your face the entire time. Many people think that it was a broken hat. Nope, that is how it is supposed to be! My favorite costume as Glinda is the Second Act Thank Goodness outfit. I feel so regal in it! Love the wig for that scene also and the cute little hat! How was the initial rehearsal process for Glinda, and what was your first performance like? I became a Glinda understudy when Megan Sikora, our Glinda understudy at the time, went away for the out of town tryout for Curtains. I learned the show rather quickly and started blocking with the Stage Manager. Once I was off-book, we started running the show with music–me and the Stage Manager up in the rehearsal room. The next step was an understudy rehearsal on the stage with the other understudies but focusing on the Glinda scenes. The next step was a full run through with the understudies which was to be a put in with costumes. That never happened! I had not yet run the show from start to finish with the other understudies, when I was called to go on. This was the Sunday before my Thursday put in. Glinda hurt her foot and the Standby was out. I was not nervous a bit. I felt very prepared with the songs and the lines due to the amount of homework I did. I was called to come in at noon before the 3pm show to run the technical bits of Glinda. I had no time to think of what a big deal it was, because there was so much to go over. Luckily, I trailed the Glinda the night before, so the backstage stuff was fresh in my mind. My dresser and hair person were invaluable to keeping me calm. One onstage blooper that I will never forget. Once during the Ozdust Ballroom right before Madame Morrible comes out to give Glinda her training wand, one of the dancers lost her wig. It landed CENTER stage, Down near the conductor. Madame Morrible had to step over it to get to Glinda. Also after the ballroom crossover, I walk dramatically offstage. It was very smoky that night with the fog. There is a moving tower that passes in front of me for the Wizard’s Chamber scene. My new ballgown was so poofy and beautiful. Unfortunately, I misjudged how much space I had and got caught in the tower. I was being dragged onto the stage! Several stagehands had to cut me out of my dress very quickly. Sometimes you forget how dangerous our show is. So many things can Kill you! Thought for a moment that I was going to be the Wizard’s little slave girl for the entire scene. That would have been a sight! Which is more exhausting: all of the dancing and heavy singing of the ensemble or the intensive acting and singing of Glinda? It seems that the dancing on that rake starts to take it’s toll on your body. Your body should never be on a slant for that long of a time. Everything starts to go out of whack! The dancing takes its toll, but after several years, my body is so used to the expenditure. That is why they say you need to change up your exercise routines. Your body gets used to it. When I go on for Glinda the emotional drain is incredible. The singing is right in the pocket o f what is comfortable for me. It is the emotional journey that exhausts me the most. You are fighting for so much as Glinda. Your loss of Boyfriend and Best friend are so great that it is hard as an actress to go through. Since our company has a Standby, the understudys rarely go on. We never seem to develop a stamina for the role. I give all out when I get the opportunity. You never know when it will be your last! Are there any dream roles you’d like to play one day? hmmm Dream roles. You mean besides Glinda? I would love to play Guenivere in Camelot. I would love to do more plays. Maria in West Side Story was always a Dream role…mostly because I would be dreaming if I thought I could get cast! Her journey is such a beautiful one. One that I would love to take. Unfortunately, I could not look less the part! Advice…I think it is imperative to be prepared. The sooner you prepare, the quicker your dreams will come true. If you need to learn to dance, do it. If you need to lose weight, do it. If you need to lose your accent, do it. If you need to save money, do it. If you need to research, do it. You have to be prepared when your chance comes or else you may miss it! Once again, we here at “Innuendo, Outuendo” thank Heather for her kind comments. Unfortunately, she will be out for a few months with a shoulder injury, but we wish her the best as she recovers and are absolutely thrilled that we got to have her as a visitor to our blog! This entry was posted in Exclusive Interviews and tagged Broadway Production, Heather Spore. Bookmark the permalink. Ooooh great interview, thank you Heather! I laughed out loud at the 'Wizard's little slave girl' bit. Love it! Heather is the best; I envy anyone who has seen her as Glinda! Wonderful interview! I have enjoyed Heather’s performances since she was my theatre student in high school. She was then, as well as now, an incredibly talented performer. I am honored to have known her in her younger days of theatre. But I am honored even more today as I see the success of her hard work. Break a Leg, sweet Heather.